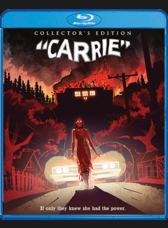 Scream Factory has announced that they will bringing Brian DePalma's Carrie to blu-ray on October 11th, 2016. We are getting a new 1080p transfer sourced from a new 4k transfer. List below are the special features. There will a regular edition and a limited editon that is exclusive to the Scream Factory website that includes everything listed below as well as a second slip cover featuring a second, newly comissioned artwork, two posters (one containing the 1st new art work and one containing the 2nd commisioned art work, and early shipping (three weeks before street date. The retail for the regular edition will be for both editions will be $34.93, but the exclusive will sell out so act quickly. A Look At "Carrie: The Musical"